In 1996, along with other Algerian authors and intellectuals, Assia Moussei founded the Al Ikhtilef (meaning “Difference”) association. It initially aimed to foster a new generation of Algerian writers through workshops and literary readings — a task that was particularly crucial during the bitter years of the Algerian civil war (1991-2002.) Her role has since shifted to becoming President and Publishing Manager of Cultural Association Al Ikhtilef, which means she runs its book publishing company, Editions Al Ikhtilef, represented at the ADIBF. Moussei agreed to an email interview to talk about her list, her own background as a publisher, and the state of Algerian publishing today. You went to medical school and worked as a doctor. How did you decide to change your profession and become a publisher and editor? I studied medicine and chose a specialty. I practiced as a doctor and had no intention of leaving the profession. In fact, I’m still a doctor: Recently, I became head of the oncology department at a hospital in Algiers, as well as assistant professor of medicine. I have tried — easily sometimes, and with difficulty most of the time — to strike a balance between two careers and two worlds. In fact, I have been very fortunate to have an opportunity not many people have to live two lives at the same time. To date, we have published more than 500 titles, and I am not exaggerating at all when I say that I feel the same joy I felt at the beginning, undiminished by the problems and difficulties we have been through. How did the Al Ikhtilef Association begin? In 1996, I founded the Al Ikhtilef Association. There were many complex reasons for it. On the one hand, we wanted to take refuge in culture when real life was extremely absurd and mad. On the other hand, we tried to raise our voice in the name of a generation that had been marginalized and kept away from decision-making and influence. There was also the problem of language and cultural doubling that worsened the status of culture and intellectual debate instead of enriching it. The mentality of the single political party was dominant, so we raised the slogan of “difference” [“ikhtilef”]. All the terrifying events that we lived through during this “black decade” taught us a lot. It taught us to always fight back against the custodians of ignorance, violence, and death with more culture. How would you describe your list? How many books do you publish annually? How much of it is fiction? How much of your list do translations represent? In 2006, we entered the world of publishing with a bang. The association was officially converted into a publishing house. We chose for ourselves a clear intellectual and critical plan, in which we would try to present to the Arab reader a group of methodological and analytical tools in order to understand the humanities as they are written in our current era. For our literary list, we focus on the novel as a carrier of the values of aesthetics, enjoyment, and as a catalyst for reading among a segment of the population that isn’t interested in the need for intellectual and philosophical books. We publish around 100 titles annually, the most important of which are our books on philosophy. There are also around twenty novels every year, and ten books in translation. What have been your most successful titles, such as prizes, praise from critics, or translations into other languages? A lot of titles have been enormously successful: the novel Dumyat al-Nar [Fire Doll] by the Algerian novelist Bashir Mufti reached the short list for the International Prize for Arabic Fiction (IPAF) in 2012. The book al-Zaman fi l-Lugha al-‘Arabiyya [Time in the Arabic Language] by the Moroccan scholar Mohammad Al Mallakh won the Sheikh Zayed Book Award in the Young Author category, and the same award was given to the book al-Mustalih al-Naqdi [The Intricacy of Terminology in the New Arab Discourse] by the Algerian scholar Youcef Oghlici. The novel Hubb fi l-Kharif al-Ma’il [Love in a Diagonal Autumn] by the Algerian novelist Samir Qasimi will be translated into French by the prestigious French publisher LeSeuil. The book al-Thaqaf fi l-Azmina al-‘Ajaf [Culture in Lean Times] by the Algerian author Muhammad Shawqi al-Zayn is one of the most important Arabic books in the field of philosophy and culture. The novels of the great novelist Amin al-Zawi are bestsellers in Algeria and every year attract great numbers of readers, as does the novel al-Halim [The Dreamer] by Samir Qasimi. Editions Al Ikhtilef has a working relationship with Lebanese publisher Manshurat al-Dafaf. How does that partnership work and how does it benefit your books? It’s a cooperative arrangement that has several dimensions. Perhaps the dilemma of distribution is its first aspect. But with the passage of time we have learned that there is a lively and basic integration [between the two houses.] We are cooperating on acquiring rights and on translation, publicity, and marketing. This partnership has opened up a lot of doors for us and allowed us to get around a lot of the obstacles that confront Algerian publishers: at the top of the list is the difficulty of distribution outside our borders and the impossibility of reaching Arab readers most of the time. A lot of authors prefer this arrangement of co-publishing. Readers are delighted to get to know literary names from two parts of the Arab world that they would not have known about if it weren’t for our reliance on this cooperative arrangement. How would you characterize the state of Algerian book publishing for publishers who are not familiar with it? 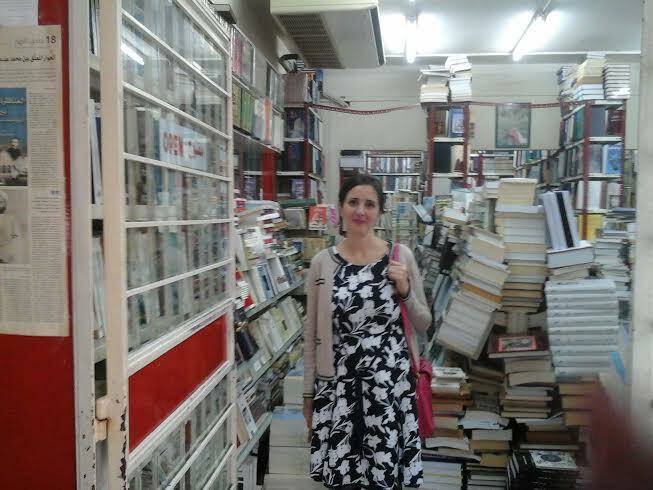 What should publishers know about Algerian book publishing? The Algerian book market can be divided into three stages: the first was the stage of the state’s monopoly on publishing, importing, and distribution, which lasted up to the end of the 1980s. In spite of the disadvantages of this period, the state ensured that libraries were present throughout Algeria and generously supported the publication of books. Government newspapers would devote pages to the cultural sphere. The second stage, during the “Black Decade” [the Algerian civil war in the 1990s] was characterized by an almost complete withdrawal from the publishing sector, and that sector’s descent into total chaos along with the dominance of books imported at random. There was also the non-crystallization of real publishing houses that would ensure that the work of publishing would be done properly. Likewise, many intellectuals and authors left Algeria, fleeing from the many threats against them, and most publishing houses closed. The third, present, stage is marked by the return of the state, through its legislation regulating the publishing industry, and by the presence of a great number of publishing houses, thanks to the Ministry of Culture’s support for books. Also, the return of the traditions of organizing international and regional book fairs. There is an honest desire on the part of the government to develop the publishing market, put it in order, and encourage reading. What are Algerian readers reading these days? What kinds of books do they prefer to read? There are two kinds of Algerian readers: the first reads basically in Arabic, and in many cases, this kind of reader has a traditional, religious background. And then there is the reader who basically reads in French: this second kind of reader is more open-minded, but he is saturated with clichéd ideas about Arabic culture and Arabic literary creativity. There is a group that reads both languages, which is the ideal group. Of course, the divisions aren’t so clear, and there is a lot of intermixing among the groups. Altogether, our readers are interested in books on religion, Arabic cultural heritage, and Islamic jurisprudence (fiqh) in general, and in books on politics and history (especially Algerian history), memoirs, and books of an academic nature. Recently, there has begun to be a strong interest in the Algerian and Arabic novel. What is the state of the e-book market in Algeria? Unfortunately, reading e-books is currently done via electronic piracy. Payment by credit card isn’t widespread in our country, and most Algerians don’t know the basics of these cards, so this tool hasn’t yet found its way to Algerian readers who still make an annual pilgrimage in droves to the International Book Salon to get books. This interview first appeared, in part, in the Abu Dhabi International Book Fair’s Show Daily. Chip Rossetti is Managing Editor of the Library of Arabic Literature. He is pursuing a Ph.D. at Penn on Iraqi fiction and is an acclaimed translator, most recently of Beirut, Beirut by Sonallah Ibrahim.